There’s no city as beautiful as London during Christmas. Each December, the capital is host to a range of Christmas markets, festive fairs and yuletide festivals. Just walk around and you’ll hear carols echoing in the crisp cold air, pop-up winter igloos taking over rooftops and the river, and the glow of fairy lights juxtaposed against the powdery white snow. Of course, there’s the world-famous annual Winter Wonderland at Hyde Park, and the larger-than-life Christmas tree that stands at the heart of Trafalgar Square, donated to the people of Britain by the city of Oslo each year. London is indeed, the quintessential winter getaway to jet off to when you want to truly indulge in the festive mood. It comes as no surprise, then, that December sees some of the highest arrivals of Singaporean visitors. If you’re heading there this December, here is our guide on how to spend Christmas in London this year. In London, there is no shortage of festive-themed pop-up events — whether it’s rooftop igloos, alpine lodges, or pop-up cinemas; just to name a few. Here are some of the pop-ups you shouldn’t miss. 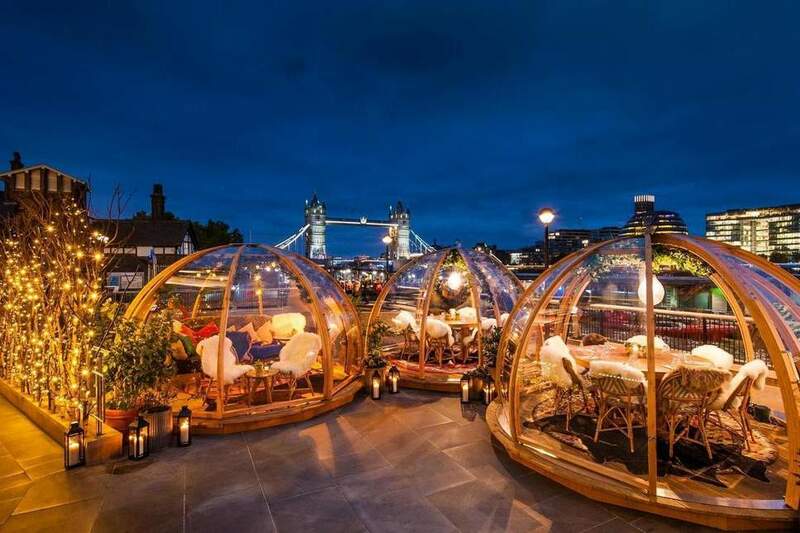 One of the more famous Christmas pop-ups are the Coppa Club igloos, which open up every year on the banks of the Thames. The terrace is transformed into a cosy set up away from the cold — complete with fluffy blankets, sheepskin rugs and scented candles in private igloos that overlook London’s Thameside skyline. This year, Coppa Club is partnering with Sipsmith to bring guests a dedicated gin menu, perfect for gin fans. Bookings are available until Thursday, 31st January. Yet another set of winter igloos can be found at rooftop restaurant Aviary, which will provide igloo domes with blue fairy lights, luxurious faux fur blankets, snug rugs, and hot water bottles, all to the backdrop of the city’s beautiful skyline. If you’re not a fan of gin, this is the place to go to instead, as they serve mulled negronis served in sharing teapots, and rum-spiked velvety hot chocolate with fluffy marshmallows. The popular Jimmy’s Lodge, a makeshift alpine chalet situated on the river along the Queen’s Walk, is back this year. This time, the rooftop has been converted into a fully-covered, cosy pop up chalet called The Refuge, boasting views across the river and London skyline. The Refuge is flanked by rustic wood-panelled walls, twinkling tea lights at every table and a fondue menu. There is also an option to dine at one of the private dining glass igloos perched on the promenade. Ice skating is one of London’s favourite winter pastimes. 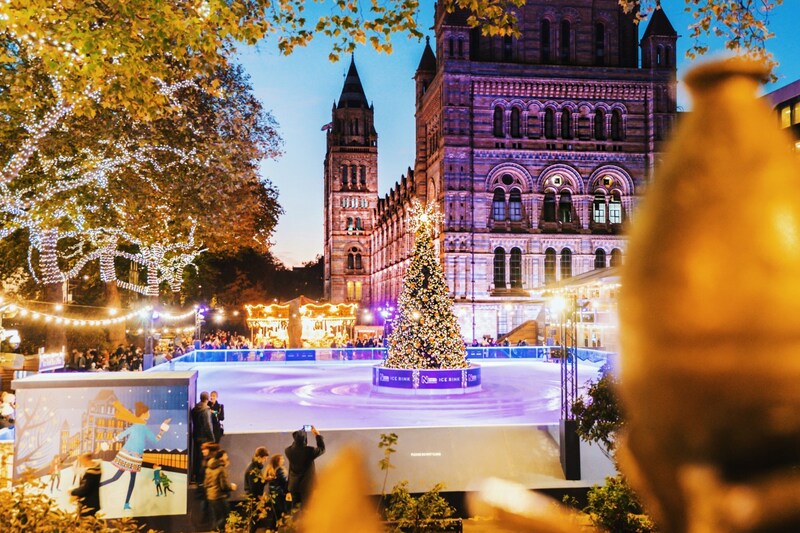 While there are several permanent indoor ice skating rinks in London, you’ll find many more outdoor ones popping up across the capital during the weeks leading up to Christmas. Glide along the ice at some of London’s most picturesque locations. The Somerset House is one of the city’s iconic heritage buildings. Spin around the neoclassical Edmond J.Safra Fountain courtyard, dubbed as one of London’s most beautiful ice rinks, before heading in and warming up at the alpine lodge from Fortnum & Mason. The pop-up will be open from 14 November 2018 to 13 January 2019. This Christmas, the Hampton Court Palace is home to a 1,040-square-metre (11,194-square-feet) outdoor ice skating rink, where you can drop by for a spin on the ice after exploring the magnificent Tudor palace, the former home of King Henry VIII. You can choose to enjoy a skating session on the glistening ice during the day, or book an evening session to see the palace light up after dark. Of course, how can anyone miss the Christmas markets, which open up all over Europe during the festive season. Whether you’re there for the mulled wine, mince pies or fairground rides, there is something for everyone at these Christmas markets. 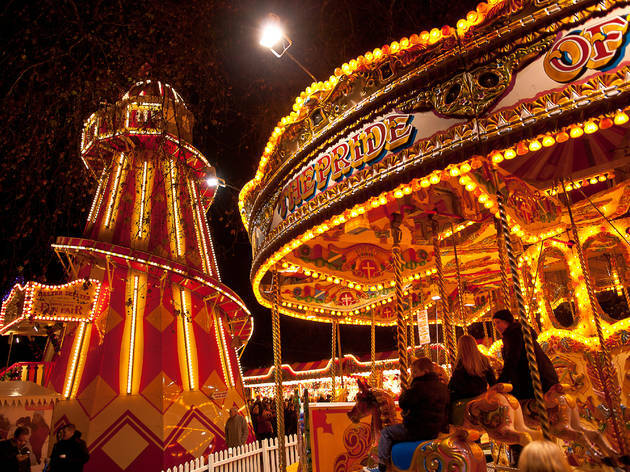 Hyde Park’s annual Winter Wonderland is one of the most famous festive extravaganzas in London. The festival is home to winter markets, festive fairground rides, an expansive ice-skating rink, food stalls, cosy wooden grottos, and booths offering gallons of glühwein. The Bavarian Village is a market treating you to a taste of Germany with its many bars, cafes, and restaurants — arguably one of the best places to get the traditional Christmas experience. This festive market, located at the very heart of London’s tourist district, is set to return for the winter season this year. Take a walk around to discover its various food and gift stalls, a large Spiegeltent which will host fabulous performances from artists such as the Burlesque Carol Concert, and many other exciting happenings for both adults and kids. 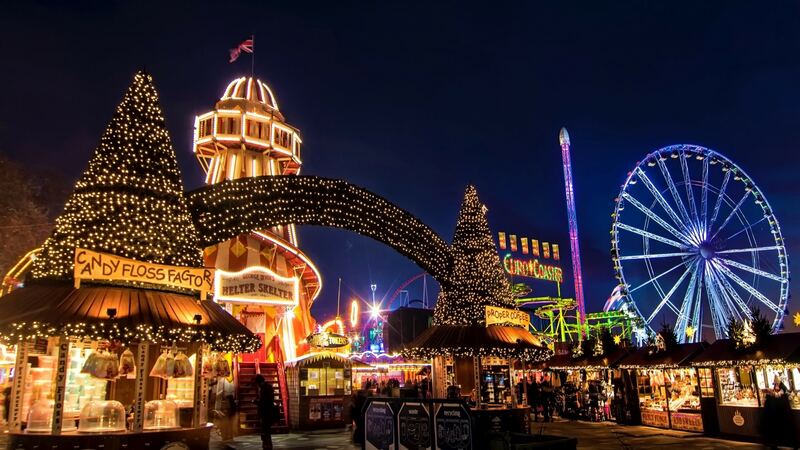 One of the first Christmas markets to open up this year is the Southbank Christmas Festival, located not far from the London Eye. The festival will host an array of shows and performances, including Rumpelstiltskin and Circus 1903, a show featuring life-sized elephant puppets alongside acrobats, contortionists, jugglers and trapeze artists. There’s nothing that screams winter more than sipping mulled wine on beautifully-decorated terraces that pop up all over the city during Christmas. If you need ideas on where to go, here are some of the most breathtaking ones. Dalloway’s winter incarnation, probably one of the most Instagram-friendly terraces in London, is back this year. 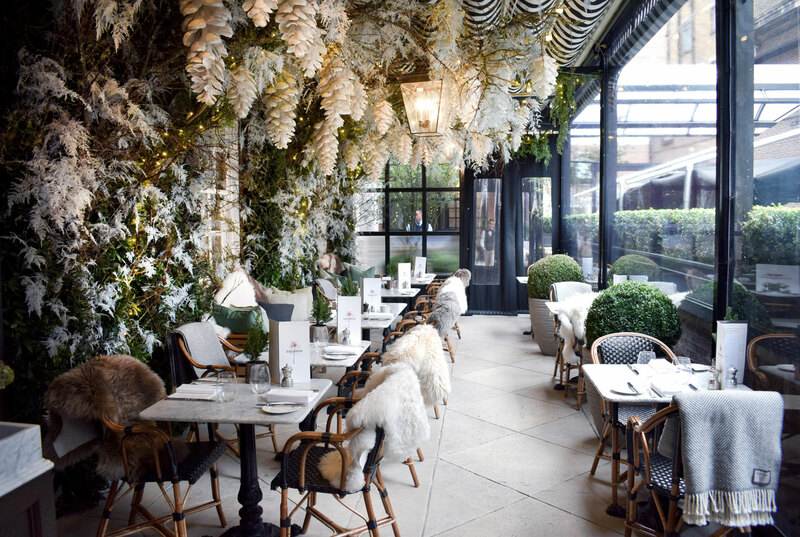 The Dalloway Terrace at The Bloomsbury has been transformed into an enchanting venue with frosted branches and a beautiful Christmas tree, and decorated with sheepskin rugs and outdoor heaters, creating the perfect setting for guests to tuck into sweet or savoury fondue alongside hot cocktails like the Spiced Pear and Rum Flip. For those who can’t make it to the slopes this winter, The Montague brings them to you at Fitzrovia. The venue is adorned with pine trees, snow, ski racks, piste maps and strings of fairy lights — all the makings of the ideal spot to warm yourself up with hot spiced cider and choc-tails mixed with Baileys or rum. Alternatively, head to the Log Cabin which features a fireplace, Christmas tree, and cosy armchairs with blankets thrown over.